This is another nice presentation from Sami Ullah, the renowned civil engineer. 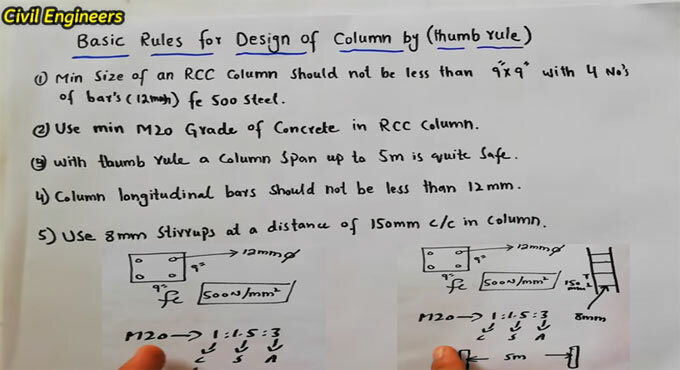 In this construction video tutorial, he briefly explains the fundamental rules which are essential for making design of column by thumb rules. Minimum size of an RCC column should remain not under 9 x 9 inches containing 4 numbers of steel bars (12 mm) with standard fe 500 steel i.e. the strength of the steel is 500 N/mm2. In RCC column, least grade of concrete should be M20. The proportion of M20 grade of concrete is 1: 1.5 : 3 (cement : sand : aggregate). According to thumb rule, the span of the column should be 5m and it fully secured. The longitudinal bars of the column should not be under 12 mm. The stirrups with 8 mm diameter should be utilized by maintaining a gap of 150 mm c/c in column. To view the graphical representation, watch the following video tutorial.